Double Glazing Installations for Commercial Properties. Based in Stourbridge, we offer our commercial services throughout Worcestershire, Worcester, Redditch, Kidderminster, Bromsgrove, Droitwich Spa, Evesham, Birmingham, Coventry, Solihull, Wolverhampton, Dudley, Stafford and surrounding West Midlands areas. Alongside our retail service, we also offer a professional commercial service. We install our full product range across a wide range of projects, working closely with local authorities, education, landlords, architects, contractors and many more. From industrial units to office conversions, an improved shop front, or new build to refurbishments and renovations, we’ll be able to meet your needs. The windows and doors that we offer across our range utilises the market-leading Profile 22 design, which has been manufactured to offer the highest standards of performance and appearance. This means that your commercial project will be enhanced to the standards of today, ensuring year-round comfort and usability. Our windows and doors can be fitted in a choice of profile styles, which means you’ll be able to bring the right feel to your home. Whether you’re looking for a modern charm or something with a traditional feel, we can help. Optima Chamfered: The chamfered profile is the ideal option for commercial projects that will benefit from a modern feel. Whether for a school or for an office, the chamfered profile is a highly versatile option. Optima Sculpted: For older properties, or more traditional projects, the Optima Sculptured profile allows you to bring a classic charm with modern benefits. This beautifully elegant profile design is sure to meet your heritage needs. As commercial properties are usually in constant use, it’s important that you bring windows and doors that are designed to perform. With our market-leading range, you’ll be able to bring something to your project that offers an impressive degree of thermal efficiency, security, durability, weatherproofing and appearance. Due to a high performance, multi-chambered profile and revolutionary centre seals, our windows and doors are able to offer you an outstanding level of thermal efficiency. This means that the warmth produced from the building’s central heating will stay within the property for a longer period of time, helping to cut down on overall running costs throughout the year. Further to this, the windows and doors that we offer across our commercial service are inherently low maintenance. They are manufactured using ergonomically friendly profiles that help to prevent dirt and dust build up and can be easily cleaned with the wipe of a damp cloth. All in all, our windows and doors will prove to be a practical addition to your building. For your complete peace of mind and consistent building security, all of our double glazed products are Secured by Design approved. This means that they have been tested and assessed by a police backed initiative, and have proven themselves to hold steadfast against the latest in burglary trends. You can rest assured that you’re bringing the best to your home. The British Board of Agrément is one of the UK’s leading governing bodies on quality assurance and puts products through a stringent process of inspection and laboratory testing to ensure their performance and structural integrity is assured. All of our windows and doors are BBA approved, passing the required tests for certification. With sustainability and environmental friendliness a hot topic in the modern age, we believe that it’s important that we offer you a solution for your commercial property that is sustainable. All of the windows and doors that we offer are manufactured from a fully recyclable profile, allowing them to be reused without compromising their quality or appearance. To ensure your building is complemented perfectly by the windows and doors that we offer, you’ll be able to choose from a wide range of colour options. 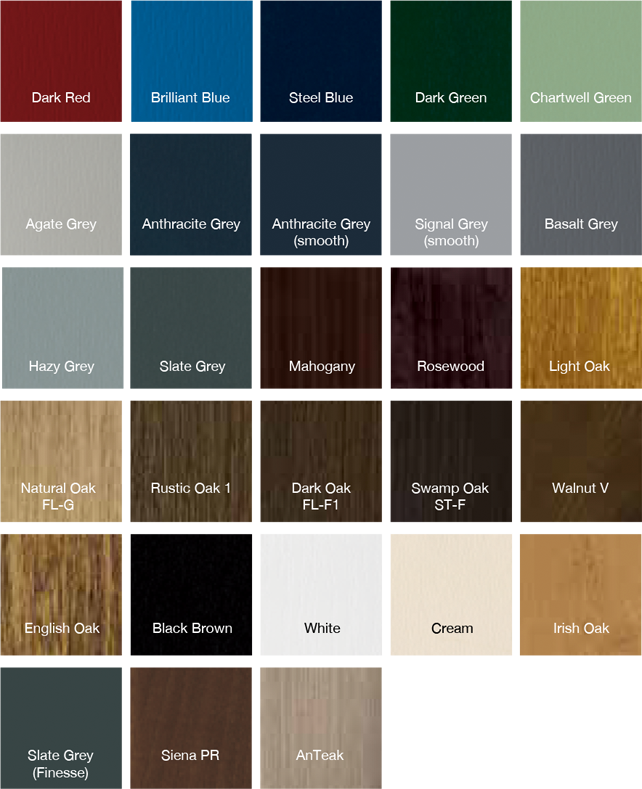 This includes a selection of standard colours, as well as a choice of woodgrain foils that allow you to enjoy the timber look without any of the maintenance headaches. Whatever you’re after, we’ll have something to suit your project. Looking for a double glazing company to help with your commercial property in Worcestershire or the West Midlands? We’re confident that our windows and doors will be the right option for your project. Visit our online quoting engine today to get a free, instant and competitive window or door quote. Simply follow the step by step process and input your specifications to get a price that is tailored to you. Alternatively, you can get in touch with us via our online contact form should you wish to get a commercial double glazing price by speaking to a member of our team. You can also use this method if you have any questions about our commercial service. We’ll be more than happy to help you get the perfect fit.